Should You Settle Your Credit Card Bill if You Can't Pay? With credit card companies increasing interest rates and minimum payments in the last several months, a growing number of consumers are struggling to pay their credit card bills. If you flat out can't pay and your credit card company refuses to lower the minimum payment or interest rate, then one option is to try settling the debt with your credit card issuer. In some cases credit card companies will agree to settle your account for less than the balance you owe. Sounds great, right? But settling your debt has some pitfalls, and you need to be very cautious if you decide to go down this road. Here are five key factors to consider. Complaints have grown about firms calling themselves "debt settlement" companies. They charge high upfront fees, tell you to stop paying your credit card bills and then say they'll negotiate settlements on your behalf. But some firms are just taking the money and failing to deliver legitimate settlements. If you need help, go to a reputable credit counselor recommended by the National Foundation for Credit Counseling. Don't count on being able to settle your debt for less than you owe. Not all credit card companies allow you to settle for less. Credit card companies are willing to settle only after you've missed payments, and that does ding your credit score. Then, if you do manage to settle the debt, the settlement appears on your credit report, too, which also lowers your credit score. 4. Settled Credit Card Balance: Do You Have the Money to Pay it Off? During the time you miss payments, your balance grows from late payment fees and interest, and once you reach settlement, the credit card company expects that amount to be paid in full. 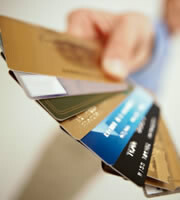 Credit card companies do not allow settlement payments to be spread out over months. You may owe taxes on the amount forgiven by the credit card issuer. Finally, Consumer Action recommends getting any settlement agreement in writing before you send money, to make sure collectors do not come calling after you think everything has been taken care of. 0 Responses to "Should You Settle Your Credit Card Bill if You Can't Pay?"